Indianapolis, Indiana USA - November 11, 2018: The Sikh Educational & Cultural Society of Indianapolis participated in the Indianapolis International Festival at the State Fairs Ground Nov 8, 9, 10. This is the 42nd year the Nationalities Council of Indiana has organized the International Festival which was attended by thousands of Indiana and other Midwest school students, teachers, and residents from across the State of Indiana. More than 50 organizations representing various countries and cultures set up beautiful booths to showcase their cultures. The Sikh Educational and Cultural Society of Indianapolis participated for the second consecutive year with an elegantly-embellished booth that featured a beautiful large photo of Harmander Sahib (The Golden Temple), the holiest shrine of the Sikh faith, a celebrated World Heritage Site in Amritsar, India as the centerpiece of their display. The display included a thoughtfully designed large poster that provided information about the Sikh faith; a hand carved and painted wooden screen with images of dancing women in festive Indian attire. There were carpets on the floor and Punjabi Phulkaris and other embroidered and embellished table cloths that adorned the space. There was information literature about Sikhs and a drawing of The Golden Temple by Indiana artist KP Singh. Throughout the three days of the International Festival, in a carefully choreographed area with gilded chairs and an oriental carpet on the floor welcomed guests, and a large TV under a canopy of red and gold strung fabric drapes showed breathtaking videos of Harmander Sahib, and introduced guests to Punjabi Bhangra, Ladies Giddha, and other facets of Sikh faith and Punjabi culture. A decorated Dhol (popular Punjabi drum) was prominently displayed at the entrance, symbolizing that the joyous booming beats and rhythms of the Dhol are an ever-uplifting invitation to celebration. This area within the booth space became an inviting intimate gathering place for kids and young adults, some as young as three years old, inspired by the videos to try their dancing skills; for special guests and new friends to gather for photographs; and for enthusiasts to take notes for their stories or class-assignments about the Sikh faith and fascinating happenings at the International Festival. There were take-home beautiful postcards and business cards by designed by Baljit Oberoi with photos and highlights about the Sikh faith traditions, history, current leaders serving and excelling in different fields. The Sikh display was thoughtful, colorful, elegant, and inspired interactive response. The display honored the 2018 Festival Theme: Destinations. The Sikh Educational & Cultural Society's choose Amritsar as our Destination, with a predominant focus on the heart and soul of the Sikh faith, Harmander Sahib (The Golden Temple), the world-famous architectural complex that welcomes all nationalities, cultures, and beings as One God's Children. 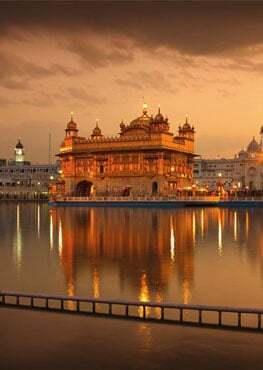 For the Sikhs, The Golden Temple is the Saint Peter's and Vatican and the Western Wall; a celestial architectural jewel placed in the heartland of the Sikhs in the Punjab. The Sikh Booth sevaks (volunteers) were elegantly dressed and exuded pride; they welcomed each guest with the uncommon Punjabi warmth and respect. Our effort and concept was well received by the attendees and won accolades from the organizers and Festival Judges. The Sikh Educational and Cultural Society display won a total of four awards, in categories and criteria designated by the Festival: First Prize in Theme, and Creativity; Second Prize in Education, and Quality. The Judges took note of the over-all attractiveness, welcoming spirit, and the spontaneous reaction of the multicultural and multi-generational crowds that visited the Sikh Educational and Cultural Society Booth. At least one Judge and many visitors commented, that the Sikh display concept and presentation beautifully met the Festival Theme and offered a fun and friendly learning opportunity for all generations, cultures, and visitors. During the International Festival, the Sikh Americans and Punjabi culture remained in the prime spotlight: Sikh Satsang member, Navneet Singh, the First Runner-up in the NCI Queen Contest served as an elegant ambassador. From the main stage: Punjabi Giddha and Bhangra dance by the ladies of the Sikh Satsang, organized by Chirjeev Oberoi; a very spirited Youth Bhangra, sponsored by Maninder Singh Walia; and a rocking presentation of Punjabi folk songs and Bhangra dancing by international celebrity, Danish-Punjabi singer and dancer - the 2018 Festival featured headliner Anita Lerche. Hundreds of Festival guests of many nationalities and of every age danced and enjoyed the Punjabi experience. KP Singh, a celebrated Hoosier Sikh shared his reflections and beautiful photos on social media each day. Civic, humanitarian, interfaith, and multicultural engagements have been a positive experience for us in Indiana. We always look to and are proud of other major efforts of organizations and individuals across the USA and around the world as our inspiration. We believe that education and networking are important for creating understanding among faiths, cultures, and communities; they are critical to a more hopeful future and our collective promise. The Sikh Educational & Cultural Society of Indianapolis has been working in Central Indiana for five decades and engaged in promoting understanding about the Sikhs, Punjabi culture and community. Please feel free to contact the Society at [email protected] if you are interested to receive the educational material produced by the Sikh Satsang of Indianapolis.